The glitz, the glam, the celebrities, and the wings (yes, we said wings)… the Met Gala once again made its annual appearance on May 7, 2018. What began initially as a fundraising event for the Costume Institute or the Metropolitan Museum of Art has now been dubbed as fashion’s biggest night. The Met Gala, in addition, has also been the platform to confirm relationships, sneak in some self promotion, and make the most influential fashion statements. The Met Gala got its start all the way in the 1960s and has only gotten better with age. Taking place on the first Monday of May, the gala was set simply to fundraise money for the Costume Institute has now been referred to as “the party of the year” by Vogue editor, Hamish Bowles. Now back in 1960, there was no desire to go above and beyond with any fashion statements, in fact, the trend those days were centered around big skirts and pearls. Initially the only eye catching pieces of costume were the ones located in the museum. Ranging anywhere from a SuperMan costume to ornate Kimonos, the Costume Institute has come to show a reflection of cultures and dominate trends of the years. Co-chair and Vogue editor in chief, Anna Wintour, has headed the event for the past twenty years raising up to $145 million dollars. Since then, however, the Met Gala has come to celebrate fashion and launch the opening for the museum’s Spring exhibition. Of course, everyone who is anyone attends the event, with actors, performers, and designers all teaming up to dominate the red carpet. With that being said, Gutierrez helped the Roaring Times break down the looks behind all the hottest celebrities. We started with Zendaya who practically slayed (Clarissa’s words, not ours) in her Joan of Arc inspired dress. Zendaya is known previously for being “fully committed and always giving 100% in every event” so it was safe to say she did not disappoint. Next is co-host Rihanna who “is co hosting and able to do anything.” Rihanna made the best dressed list of all time in 2015 with her yellow Guo Pei Cape and this time she killed in an ornate ensemble with matching head piece made to resemble the Pope. Another notable mention is Kim Kardashian who turned heads with the absence of her husband, Kanye West, although he normally attends the event. The Kardashian played it simple which seemed to work best seeing as they are subject to the limelight all the time. 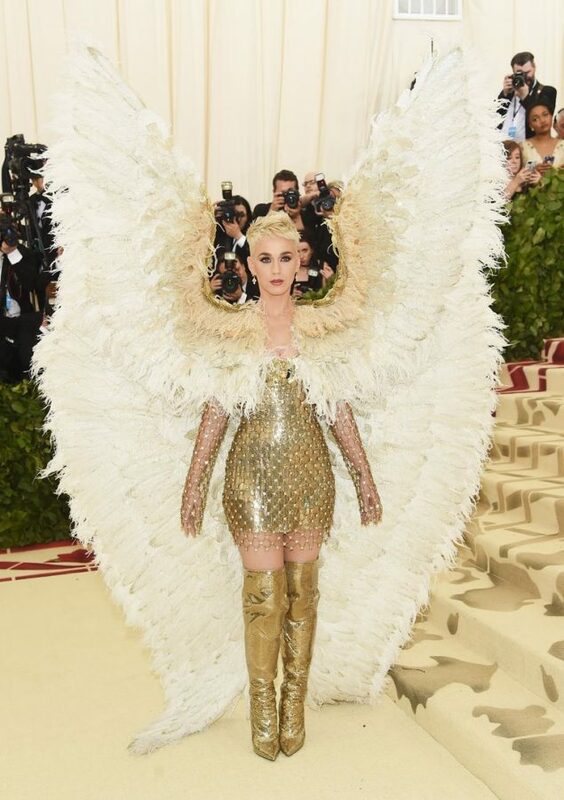 Katy Perry, arrived at the event with a full pair of white angel wings as a way to embody the theme. Our expert weighed in explaining that it should not have been such a big surprise considering that “Katy often incorporates angels and the devil into her music videos as does the Weeknd” so for her to incorporate it into her clothing. Yet another candidate for Best Dressed was Blake Lively, who stole hearts in an intricately beaded red and gold gown topped with a golden halo-esque headpiece. Shawn Mendes and Hailey Baldwin confirmed their relationship on the red carpet while simultaneously activating tear ducts and tugging at heartstrings. Nicki Minaj, Jaden Smith, and Donald Glover usef their red carpet appearance to thank their fans for all their support. The fashion event equivalent to the Super Bowl passed off yet again without a hitch. The stars continued to shine and bring recognition the the world of fashion.